In simple English, the Sanke (sahn-kay) is a white koi with large red patches over which there are smaller black accents. The Japanese word "san" means three, thus the Sanke is a tri-colored koi. 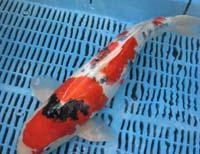 It is the second of the top three best known and depicted varieties of koi called the "Gosanke" (Go-sahn-kay) group. This variety is known by several other names. Taisho Sanke was named after an era in Japanese history in the early 1900's when this koi variety was in the infancy of its development. In some writings, the hobbyist will see this variety called Taisho Sanshoku (Tie-show Sahn show- koo). Again this term emphasizes the three colors. I can easily remember how confused I was when I started in this hobby with all the foreign words and want to spare you some of the difficulty! However, some Japanese terminology is necessary. 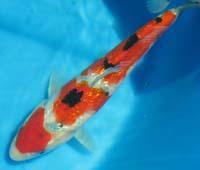 The Sanke is basically a white koi with red patches, following the guidelines of the Kohaku and then has the addition of black accent marks. As discussed previously all factors to appreciate a good Kohaku must be existent in this variety: a good healthy conformation, a richness of color, good skin quality, and a pleasing pattern. The white body is called the "shiroji" (sheer-ro-gee) which sets off the pattern. It is the canvas for the masterpiece. The white in a "perfect koi" is homogenous with no shadows. Sometimes a koi will have a yellowish cast, especially in the head area, which is not as desirable. On a young koi, many times the white has a bluish cast which usually turns to white as the koi matures. If the white has a pink cast it usually means that there is red pigment coming in or leaving. 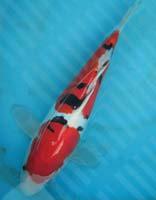 Remember, these hybrid koi are changeable, sometimes to our chagrin and other times to our good fortune! The red or "hi" (hee) must be of a consistent color having a depth so that no white shows between the scales. There are many shades of red from a dark purple-red to a bright persimmon. In a young koi, the "hi" is lighter and usually tightens and becomes deeper as the koi matures. The line definition between the red and the white color must be sharp and clean cut. On the leading edge of the red pattern, there may be a bleeding of color due to the red scale being below the white scale in front. This is known as "sashi". In the show world, a koi with sashi one scale in width is acceptable. Anything beyond that gives the koi a messy appearance. The pattern appears blurry. On the trailing edge of the color patch the division of the two colors should be sharp. It is known as the "kiwa" (kee-wah). If the edge is straight and knifelike it is called "kamisori" (ka-mee-sor-ee). If it is scalloped and follows the shape of the scales, it is known as "maruzome" (maahr-ru-zoh-may). Much is written about the third color, the black accent called "sumi" (soo-mee). It should be patent leather black, lacquer-like in gloss. The black should be so thick that none of the underlying colors can be seen through the black. Some black spots have a cast of blue, and others are a bit grey but the most desirable is the shiny ink black sumi. These variances are due to different lineages of the Sanke variety. Black sumi accents have been compared to stepping stones leading the eye from the head to the tail. Depending on the genetics of the koi, the sumi spots can be rather small and scattered or large and bold. At any rate, the edge of the black pattern must be sharp and clearly defined. It is believed that the black accent on the white background is more pleasing and rare. It is known as "tsubo sumi" (tsoo-bow soo-mee). If the black is on the red it is known as "kasane sumi" ( ka-sahn-nay soo-mee). Standards have been written and implemented to judge the worth of a koi. I realize that many hobbyists buy a koi which pleases them regardless of the standards exhibited. 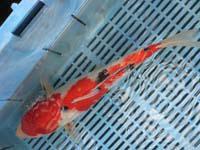 However, I think the hobbyist should be aware of the elements which make a koi valuable. If the koi has one pronounced patch on the head which does not cover the eyes in addition to hi markings on the body it is known as a maruten sanke (mah-roo-ten sahn-kay) and often is very beautiful. If the koi has a predominance of hi pattern and very little white background, it is known as an "aka sanke" (ah-kah sahn- kay). "Aka" is another word for the color red. The pattern should be of a pleasing shape on the head not extending below the eyes. The most common is the "kutsubera" (koo-tsoo-ber-ah) or horseshoe pattern. However, there are artistic exceptions to these rules. A very famous koi is called the "crown sanke" for its interesting head pattern which does not conform to the prescribed standards but is so very beautiful. Sometimes the hi will go over one eye but if this imbalance is artistic with the rest of the pattern it is not only overlooked but very appreciated for its uniqueness! At the left is an award winning Sanke from an All-Japan show in 1989. Notice the clarity of the shiroji (white, the clearly defined edges of the hi [red] patches) and the artistically placed sumi (black) spots. One fin has only one stripe and the other none. This is overlooked as it seems to balance with the overall pattern of the koi. If the red covers the entire face it is called "menkaburi" (men-kah-bur-ee) and is very seldom attractive. If there is "hi" on the mouth, it appears as lipstick and is referred to as "kuchibeni" (koo-chee-ben-nee). "Kuchi" is mouth and "beni" is another word for the color red. It sometimes will balance the pattern and appears cute on some koi. There should not be any sumi or black spots on the head. The fins, both the pectoral and the dorsal may be completely white or have a few (no more than three) black stripes, "tejima' (tay-jee-mah). This is a characteristic of the Sanke variety and some say it indicates the stability of quality of the sumi. See the award winner from Japan above right. There are other versions of the Sanke such as scaleless or "doitsu" (doy-tsoo). I am including a picture of a small scaleless Sanke with this column so you can see the clarity of color and the sharpness of the kiwa. With the absence of scales the colors are brighter and more dramatic. Another variety of Sanke is kin gin rin or diamond scale (keen-geen-reen). The scales shine like little diamonds as seen in the picture at the right. We will cover these variations more in depth in future columns. When looking for a young Sanke, look for a pleasing body, a Kohaku pattern which extends below the lateral line, and has indications of future strong sumi accents. The challenge is to have all three colors peak at the same time. When this happens the Sanke is quite an elegant koi, the white background lustrous and creamy, the red patches are bold and dramatic, and the lacquer black spots are the jewelry making the Sanke quite a wonderful sight in the water! Not All Koi Are Created Equal!